The current Tesla stock quote is priced at $251.19. That's down 1.9% for the day, but up nearly 13% for the year. From the beginning of September 2014 through the end of March 2015, TSLA stock suffered a 34% swoon. One of the main reasons was falling oil prices. Some investors worried low oil prices would lessen demand for electric-vehicles. A disappointing earnings report in February also contributed to the dip. For Q4 2014, TSLA reported a miss on earnings, revenue, and deliveries. But Tesla's announcement that it will move into the home battery market has helped the stock rebound. On April 30, Elon Musk unveiled the company's new "Tesla Energy" division, and the home batteries, or "Powerwalls." The units will be built using the same lithium-ion batteries that are used in Tesla cars. Different models can store either 7-kw or 10-kw of solar power. It's a major shift for the company, making Tesla more than just a car company. "Tesla is not just an automotive company, it's an energy innovation company," the company said in a statement at the time. "Tesla Energy is a critical step in this mission to enable zero emission power generation." 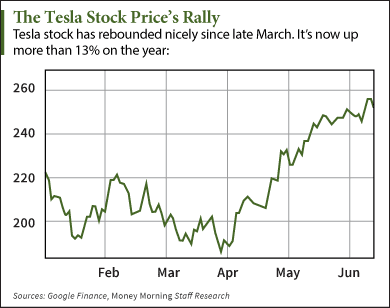 Since the end of March, the Tesla stock quote has climbed 32%. It's up 24.2% in the last 12 months and 656% since the start of 2013. It's one of the most volatile stocks on the market, and any bit of news can make the stock soar or plummet at a moment's notice. That's why investing in Tesla stock can be extremely difficult.